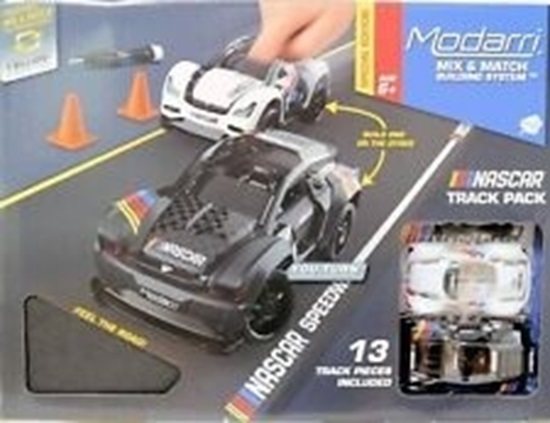 Build your own Modarri NASCAR style race track, decide on what parts that are needed. This set you are purchasing has 13 (including wheels) pieces, which can create 10 variations of the car. Build your own NASCAR-styled race track. This kit has 13 pieces of soft yet durable foam track, racing accessories, and an entire car with extra race day parts.6 pieces of curved foam track, 5 pieces of straight foam track, 2 pieces of Y-shaped foam track,16 pieces of racing accessories,8 orange racing cones,8 hard interlocking racing barriers, 13 Interchangeable Modarri car parts, 4 Wheels,2 Suspensions1 Chassis1 Seat2 Fenders-2 Hoods,1 Metal Frame,1 swivel-tipped hex screwdriver,1 Sticker Sheet, Ages 6+,New in box.